More than a third of us wear a uniform at work. The problem with that is, as with most garments, when uniforms reach the end of their life they are merely tossed in the bin. In fact, a staggering 90% of the 33 million corporate garments given to staff every year end up in landfill. That adds up to 15,000 tonnes of clothing. The cost of waste disposal alone comes to £1.2m in Landfill Tax. But recycling or recovering old uniforms is not easy. Polyester, the material of choice for most corporate uniforms, is infinitely recyclable. But collecting branded clothing throws up a number of security and brand reputation issues; it is no wonder so much ends up buried in the ground. Ocado, the world’s biggest pure-play online retailer, has been determined to do something to not only reduce the environmental impact of its staff uniforms – but to do so in a way that directly benefits people too. More than 5,600 people at Ocado wear a uniform for work each day. When those uniforms are no longer needed, they are sent to HMP Northumberland. There, the garments, which would otherwise have been incinerated, are totally transformed. Unwanted fleeces, trousers and polo shirts are de-branded and turned into raw materials. These are then turned into new products which are sold online, with proceeds going to charitable recycling projects. “We take the same approach to uniform refashioning as we do with redistributing food waste; we try not to offload our responsibilities on to somebody else,” says Head of Corporate Responsibility, Suzanne Westlake. The process – including designing and cutting new patterns and machine-stitching finished products – constitutes a complete manufacturing process. And that is crucial because it means the work being done to design Ocado products counts towards offenders’ studies for a Performing Manufacturing Operations qualification (PMO), equivalent to a Level 2 NVQ. In the last three years, 17 offenders have successfully completed the PMO, with another 61 now enrolled on the course. Everybody that has been offered the six-month course has voluntarily taken the opportunity, and so far the course success rate is 100%. 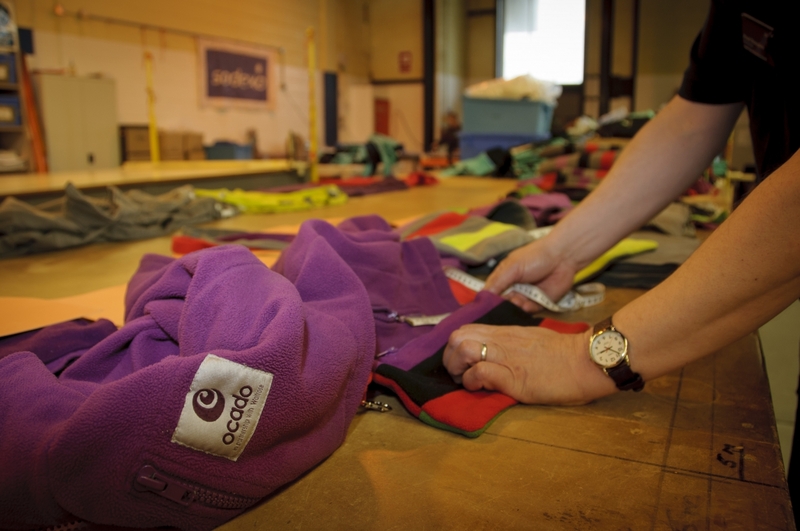 “Not all of our projects are end-to-end, so it’s nice to work on the Ocado stuff and see the finished garments evolve from raw fabric,” says Ian, an offender at HMP Northumberland. He has spent the last 15 months gaining the PMO qualification and progressing to be a supervisor. “When I first came in, I knew nothing about textiles. I wouldn’t have thought you could do this kind of thing with an old jacket. These projects make your mind tick over and help you feel more useful. So far, 99 tonnes of uniform has been sent to the prison for recycling. The company has also recently donated 800 of its de-branded waterproof coats through a partnership with Sodexo, supporting a local charity that helps families in poverty and the homeless in Newcastle. Yes, the project with HMP Northumberland is helping Ocado to reduce its environmental footprint. But the initiative is also enabling offenders to learn a trade, which in turn increases their self-esteem and boosts their chances of finding meaningful employment after release. “Education has the power to change lives,” adds Westlake, pointing to studies that show offenders who find sustainable employment after release are 50% less likely to be re-convicted than those who do not. At working prisons, such as HMP Northumberland, 60% of offenders secure employment or training after release – 50% higher than the national average. So, what’s next for the initiative? Well, the UK Government seems to be supportive of a more widespread adoption of such an approach. A House of Commons All Party Parliamentary Group on Ethics and Sustainability in Fashion, brought together a range of companies, including Ocado, as well as the third sector and government representatives back in 2015. There they discussed new ways to recycle and refashion more textiles to avoid landfill, including the example of what Ocado has now started. For the HMP Northumberland partnership, there is certainly a desire to scale things up so that the offenders have even more materials to work with. At the start of the partnership, there were two items made from trousers. That has already grown into ten designs, conceived, designed and created by the programme. More elements of the old uniforms are being used in the creative process, such as fleeces and polo shirts. Ocado’s approach to dealing with a tricky and complex challenge shows how creative thinking and a partnership approach can build a long-term, replicable business model that goes beyond purely environmental impact reduction. Do You Have the Right Staffing Levels to Manage Your Companies EHS & Sustainability Risks?